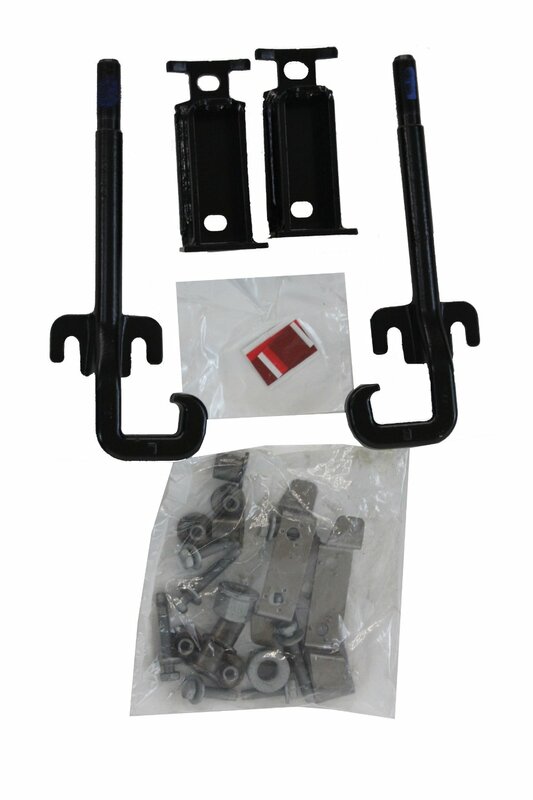 If you need secure and highly durable hooks to mount a tow to the frame of your Jeep, try the Front Tow Hooks available at JustforJeeps.com. Rated with a towing capacity of up to 5,500 pounds (or 1 1/2 times the vehicle's gross vehicle weight rating), the Front Tow Hooks by Mopar have passed extensive and rigorous tests to ensure their durability and their load capacity. Item No. 82212095 is compatible with the 2011-2018 Jeep Grand Cherokee. 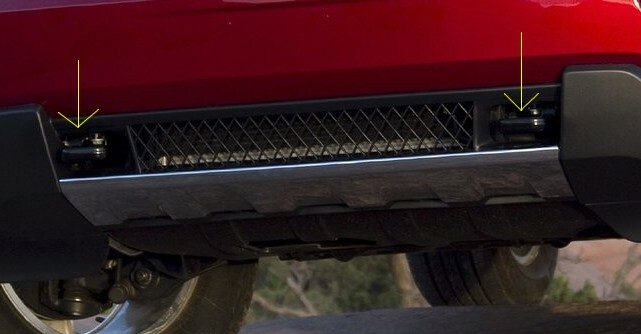 The front tow hooks will not fit the export model of the Grand Cherokee from 2011-2018. Comes as a set of 2 front hooks with hardware. 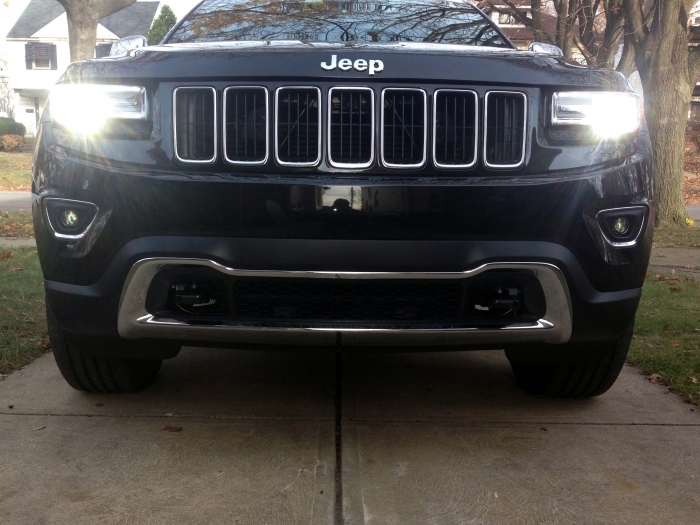 Not designed to be used with the Summit, High Altitude, SRT8 or Trackhawk models. I purchased tow sets of these - that is 4 towhooks. Just for Jeeps called me within minutes to ensure that I wanted two sets. I did need two sets; my girl and my buddy's Jeep. First install took 2 hours, second install took 1 hour. Hope the only reason you may need these is to pull a "little old lady" out of a ditch! The install is pretty straight forward. The directions are exactly correct, missing a few clips to remove etc and I didn't have to remove the skid plates as indicated, but you may want to anyways. I put these on my 2012 Summit in about ninety minutes. The lower portion of my fascia did come with the knock outs from the factory and the ACC sensor does not interfere with the hook hardware. Not sure why the bold type "not for summit" disclaimer. My '15 Altitude didn't come with hooks and this kit has everything needed to add them and great instructions making it very easy to install. Quickly shipped and arrived way faster than I expected. Product is great! Only issue is the instructions may need to be updated. We have a 2018 GC Altitude and I will either have to cut the lower air dam or buy the part. Still deciding on that. However, the two hooks will be perfect as this vehicle as no other points to get pulled out of a sticky situation if that ever happens. Fit my jeep fine. The directions could show a bigger difference between the bolt sizes. 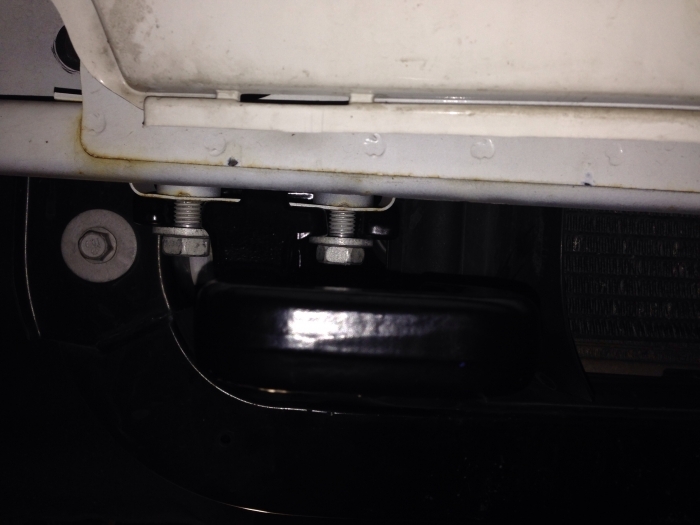 The shorter bolts are used first to bolt the bracket to the frame. Then the longer ones through the spacers and hooks. It wasn't obvious at first. This look awesome and are pretty easy to install. Exactly what I was looking for to give my WK2 a different look. ProsIf you ever need to contact customer service- they are Awesome! Will take are of you ASAP! 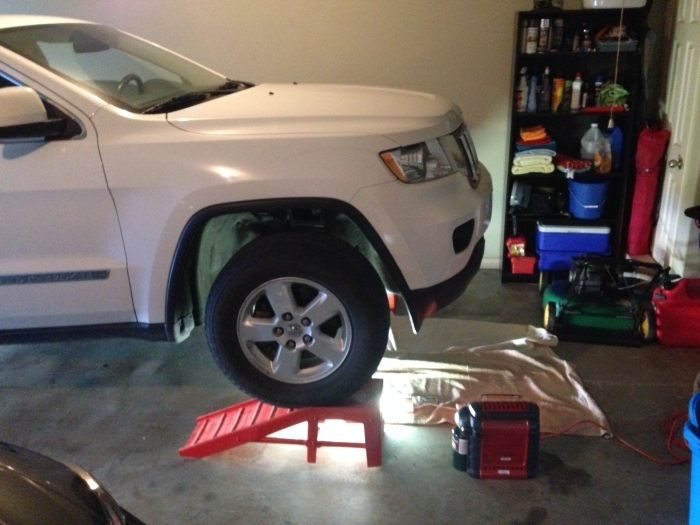 Product was just as expected and fit perfect on my Grand Cherokee Limited. Perfect fit. ProsVery durable paint coating Fit perfect with existing hardware. Everything arrived as needed for the install, watched a quick install video on the web and was done with the install in about an hour. The great thing about these tow hooks is that all the holes and threaded inserts are already there. Installation is easy and quick, once you get the lower fascia off. My only complaint is that the instructions haven't been updated for the 2015 model. The number and types of fasteners that hold the lower fascia in place on the 2015 model are different than the instructions. It just takes some careful looking to find the fasteners. The instructions call for a 30mm socket to tighten the large nut that holds the hook into the bracket. I don't have a metric socket that large in my tool box, so I was afraid I'd have to go out and buy one. However, that nut only needs to be torqued to 18 ft-lbs. I found that careful use of a 1-1/4 inch six-point socket will tighten this nut without damaging it, even though the socket is a little too big..
Tow hooks look very nice after install. Installation instructions weren't so good. The instructions that came with mine were not for a 2014. They call for removal of more plastic rivets and screws than are on the vehicle body parts you are removing. Also my instructions came with an addendum regarding double sided tape. This addendum was vague and didn't help a bit. If your instructions come with the addendum search mopar part number K6860823 for good instructions. Front fascia was fairly easy to remove and re-install. ProsLook very nice after install. Easy to install. Directions provided aren't for the 2014 model but most steps apply. The front bumper cover is easily removed but plan on replacing the 4 plastic retainers that hold the inner fender liners to the fender. These will most likely stretch and break when removed. 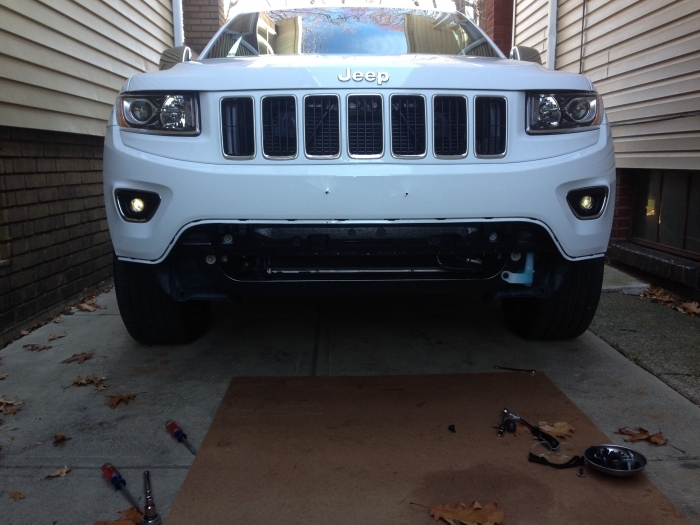 About 1 hour start to finish for installation on a 2014 Grand Cherokee Limited. Looks great and was fairly east to install. I have no mechanical experience and it took me 2 hours to do the job, mainly because I went super slow so I wouldn't break or scratch anything. Fairly easy install....anywhere from 1 to 1 and half hours. All parts included. Basic tools required. Check jeepgarage.org for step by step photo instructions. I added these tow hooks to my 2012 Grand Cherokee Altitude. It was mildly tricky removing the front fascia, but only because I had never done that before. It's just a matter of removing a bunch of screws, and then yanking out the force-fit tabs and trusting that they won't break (they didn't). Anyway, all the right hardware was included, and no special tools required beyond the usual socket drivers.